With Winter well and truly here, the thought of staying in curled up in front of the TV becomes more and more appealing. To make the most out of this time of the year, why not think about upgrading your home entertainment system? Home Cinemas are becoming more and more popular and this time of year is the perfect opportunity to upgrade to make the most out of all the great TV shows and movies available. Sight & Sound has been installing home cinema systems up and down the country for a number of years and here are some handy tips that we find help our customers find the perfect system for them. All projectors are different; some are made for the classroom while others are specifically designed to display HD quality movies. It’s important to think of all the connections you have in your home and which ones you would like to be able to view through the use of a projector. Do you want to be able to use your Xbox or Playstation to experience a gaming experience like no other? 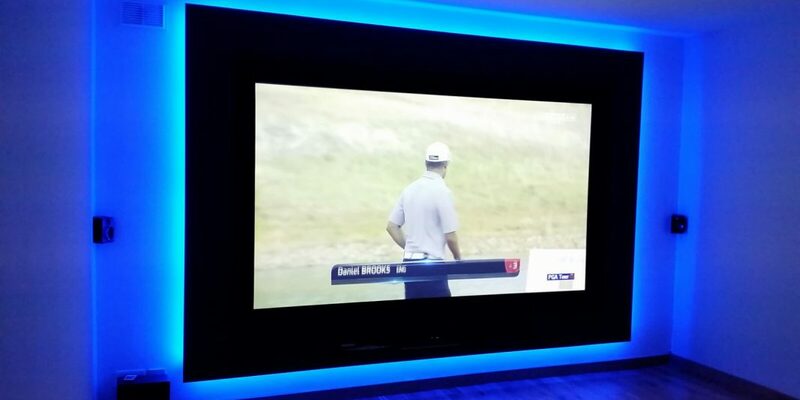 Do you want to use your Skybox to watch all of your favourite shows on a large scale screen? These are all things that you need to consider before purchasing or installing a home cinema projector. The simple solution is to make a note of everything that you want to be able to use through your projector and then let the professionals recommend a model that best meets your needs. This has nothing to do with how far you can throw a football. The throw distance in the audio visual world is all to do with the distance from your projector to the screen or wall that you are planning to project onto. This distance is needed as projectors require to be focused so that there is always a crisp and clear image on the screen. Having an idea of where you want to install your projector and the distance from that point to your projection surface can go a long way in getting the right projector for your home cinema. Knowing the throw distance is the first step in getting the right projector for your home. Before getting in touch with an audio visual company with a home cinema inquiry, take a look at the living room or space that you are planning on having the equipment installed. There are a number of factors that can impact on the suitability of a room for a home cinema system. What type of ceiling is there? Are there are any suspended light fixtures? Is it a bright room with plenty of windows? These are the kind of questions that you need to know the answers to for a successful home cinema install. Not sure if your room will do? Not sure of the answers? Take a few pictures and send them over to via an email. A home cinema site visit can also be arranged. The final thing to consider when it comes to a home cinema is if you wish to install the system yourself or do you want a professional installer to do the job for you. Sight & Sound can offer you both options as they both have their own benefits. Home cinema installs normally take 1-2 days and there are a number of ways projectors & screens can be installed. You might also want to consider what type of system you want installed. Some home cinemas are projectors only while other homes include full setups of a projector, screen, sound system and speakers. Winter is the perfect time to install a home cinema system. You can reap the benefits of all the great content on TV and also have the system in place for the Spring & Summer of sport. Why not call Sight & Sound today to discuss what package best suits your needs? Call us today to speak to a professional or to arrange a home visit.